📌 Good evening! Over the past six months, we’ve taken CoinSnacks to new heights all thanks to you. What started as a basement hobby and weekday water-cooler banter, has quickly turned into something much bigger than we ever imagined. Our mission remains the same: Help readers dig through the noise by providing weekly batches of curated (and digestible) good reads worth sharing. But with bigger visions abound, we need your help. If you love what we do each week with CoinSnacks, tell a friend! And make sure you enter your email for a chance to win $100 BTC by clicking the button below. Nic Carter, cofounder of Coinmetrics, is fed up with all the nonsense journalism of crypto and he’s not afraid to show it. Here is an awesome line by line rebuttal to some of the more egregious claims from journalists who are either ignorant or unwilling to learn about cryptocurrencies during their reporting process. We have to give credit where credit is due. 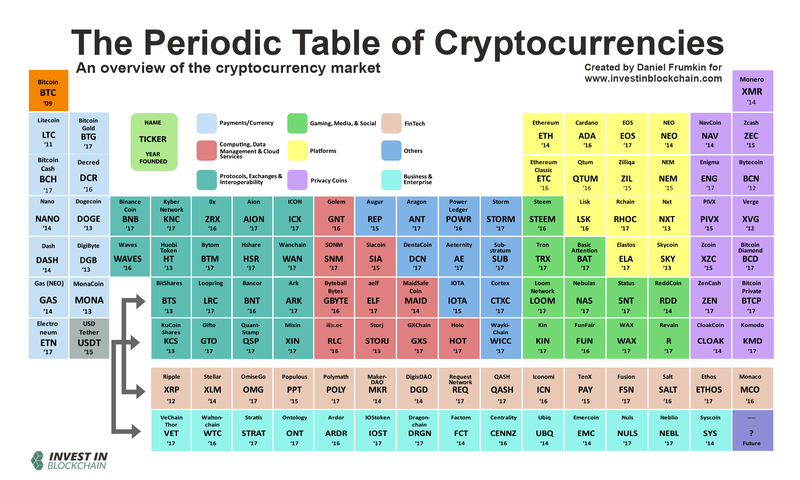 Invest In Blockchain created a beautiful graphic this week that we think simply sorts the top cryptocurrencies into their respective use cases. With all the cryptos out there, and the constant influx of new ones, it’s hard to keep up. What’s the difference between ZenCash and Zcash? Should I prefer Bitcoin, Bitcoin Gold, or Bitcoin Cash? …It’s no small task, but hopefully this chart makes it a little easier. Forget what the price of your favorite cryptocurrency is for a second. Let’s take a step back, ignore the markets, and realize that there is no need to worry. Underneath the veil of price movements, construction of a solid foundation is continuing to occur – here’s a closer look. Crypto asset valuations have certainly seen better days… But to be blunt, there’s plenty of reasons why that’s the case. Here’s just a few from our friend Jonathan Cheesman. Has Bitmain Been Selling off Bitcoin for Bitcoin Cash Prior to IPO? This week we’ve found some interesting rumblings surrounding the leak of Bitmain’s pre-IPO investor pitch deck. For those interested, Bitmain – the worlds largest crypto miner AND supplier – looks to be strangely tied to the price of Bitcoin Cash (BCH) after perhaps one of the most botched trades of 2017. Max Bronstein compares the existing financial system… where we are today… and of course, where we are headed. Despite the lengthiness, this is a great read for those fairly new to the blockchain arena. In this comprehensive overview, Richard Chen of 1confirmation, covers the latest experimentation and research in four areas of the privacy landscape: 1) privacy coins, 2) smart contract privacy, 3) privacy infrastructure, and 4) privacy research. Amongst those who believe crypto technology to be everlasting and important, there are two dominant viewpoints as to what crypto is actually all about. Enter, the Computerians vs. Fiscalites debate. After President Donald Trump implemented tariffs on Turkey’s aluminum and steel exports to the US last week, the Turkish Lira declined over 14% against USD. As the lira tumbled though, the trading volume on some of Turkey’s largest cryptocurrency exchanges, including Btcturk, Koinim, and Paribu surged by over 100%. Let’s get those volumes pumping! The Jamaica Stock Exchange (JSE) will soon be giving investors the ability to attain cryptocurrencies as trade-able assets. The JSE said it has signed a memorandum of understanding (MoU) with the blockchain startup Blockstation who will in turn help create a new digital assets trading platform for the country. Set to go live this year, which tokens will be listed on the platform is still unclear. We wanted to switch things up a bit this week due to current price discovery/ sideways market conditions by not producing any risky trading signals. 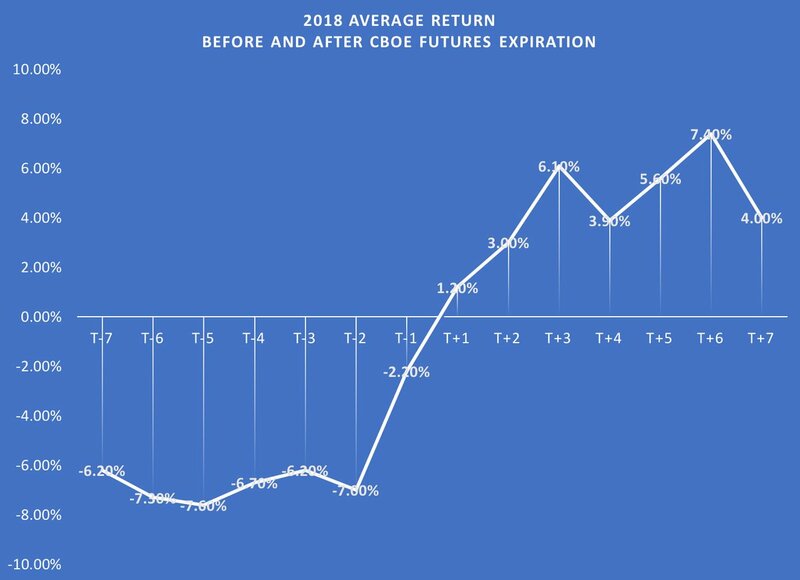 Instead, here’s an exploration into what happens after the CBOE Bitcoin Futures Expiration. This chart shows that bitcoin (BTC) tends to recover after expiration. We’ll be keeping our eye on this as a wave of futures contracts just closed today. Is this the end of HODL?